Halloween Back Issue Sale & Costume Contest! 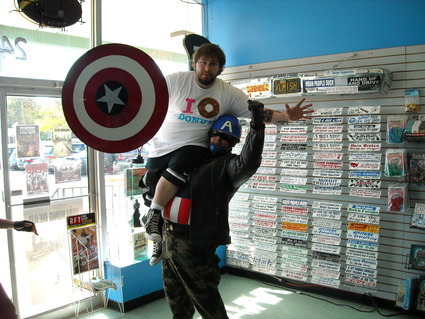 This was the fattest kid that Cap saved from Germany ... he kept shouting "Ich liebe das Gebäck"We want to thank all of you for coming out to the back issue sale over the weekend. It was another resounding success and we're always glad to see some of our back issues find a new and loving home. As per usual we had our Annual Costume Contest to coincide with the Back Issue sale and we had some great entrants again this year! 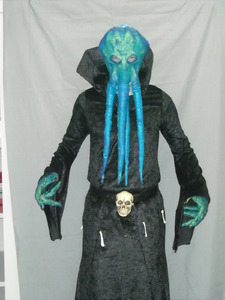 Please head over to the galleries to check out the contestants and vote for your favorite costume in the General Category and the 13 & Under Category. We've also got tons of great photos from the sale! Be sure to check them out so you'll know what you can look forward to next time around! We’ll be bringing out tens of thousands of unorganized Warehouse stock and selling each book for 25¢ a piece! We’ll also be holding our 3rd annual costume contest with prizes to be given after voting is held. The contest will be held on our website after in the week following. Show up in costume and get $5 in Free Back Issues*! Also! Each store (including the Saint Charles Store) will be selling their regular stock back issues for $1.00 a Piece! In addition to sales to be announced at each individual store! AND Don't forget to get your raffle tickets! *Fantasy Shop Employees hold the Right to right to determine what defines a costume.